..................................................................................................................... .. (iv) A/F. . . . . . . . . . . . . . . . . . . . . . . . . . . . . . . . . . . . . . . . . . . . . . . . . . . . . . . . . . . . . . . . . . . . . . . . . . ..
11. 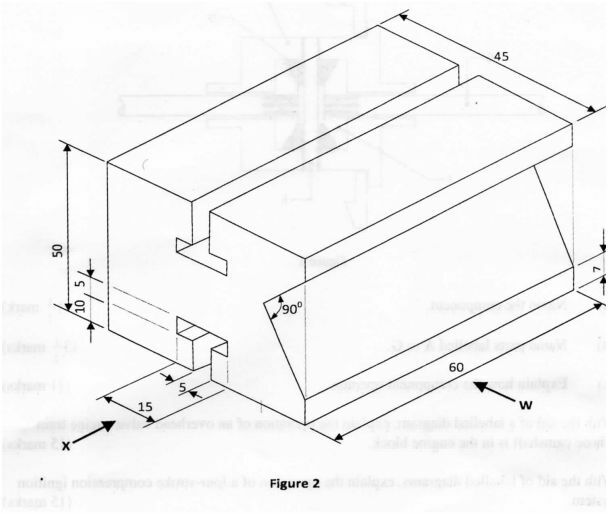 Figure 2 shows an isometric view of a Vee block resting on one side. 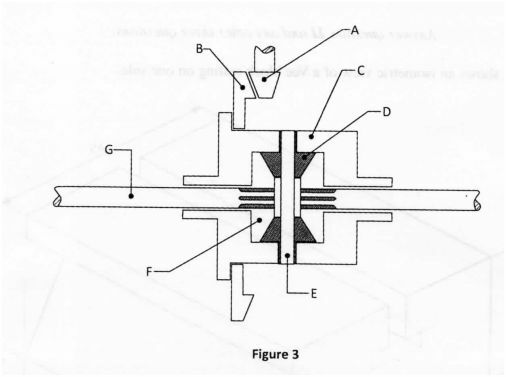 12 Figure 3 shows a component of the power transmission system of a motor vehicle. 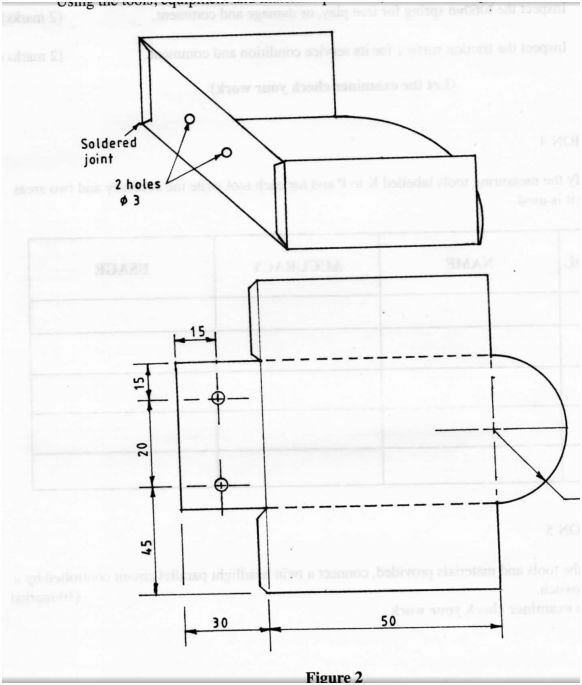 Using the tools, equipment and materials provided, make the scoop shown in ﬁgure 2. (ii) depth of the splines. 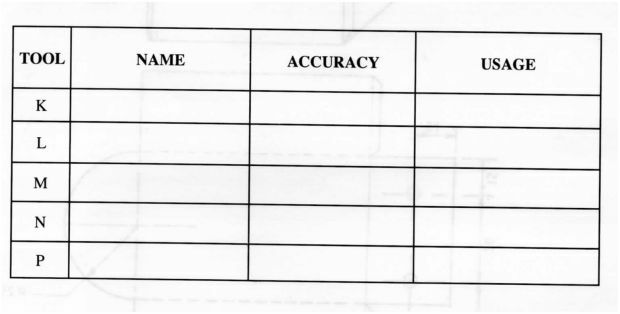 Identify the measuring tools labelled K to P and for each tool write the accuracy and two areas where it is used. Let the examiner check your work. 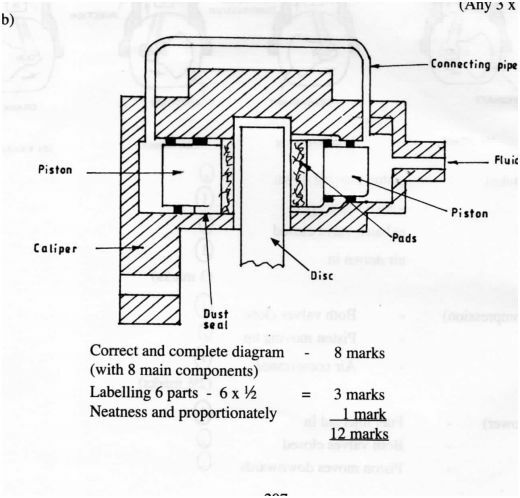 (a) Demonstrate to the examiner how to check the roundness of the camshaft using a dial gauge. (b) Count the number of teeth on the crankshaft and the camshaft and calculate the gear ratio. 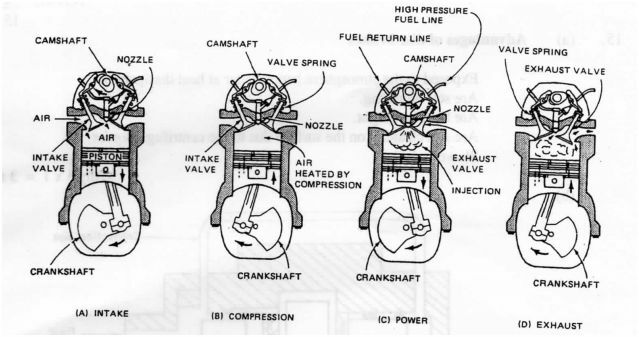 Can'y out a compression test on the single cylinder engine provided and record the reading in the space provided. Compare your reading with the recommended reading provided by the examiner. on vehicle performance. Complete the table below. 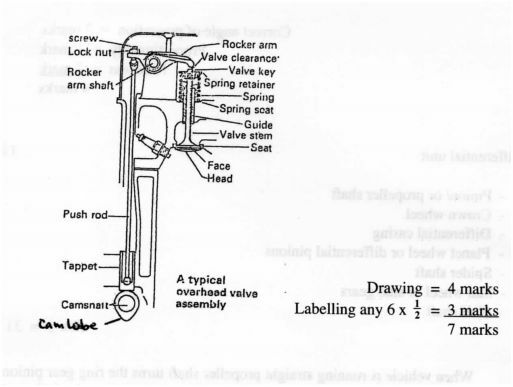 Using the tools and materials provided perform the following operations on the mechanical fuel pump provided. (b) Check the service condition of each of the following parts and comment on each. 1. (a) Factors to consider when putting up a motor vehicle, spare parts shop. Number of motor vehicles within the chosen locality/demand for spare parts. Type of customers (small scale or large scale). b) Reasons for studying power mechanics. It provides learners with knowledge, basic skills and attitudes used in industrial world to enable them to be market ready. Prepares learners to be better consumer or producers of industrial goods and services. To develop learner interest and talents that may lead to a vocation. - They cut their own thread, when screwed into drilled holes. Therefott they can be used in holes with blind threads. - They don’t get loose easily as ordinary screws do. - Can be used to drill holes on soft materials. - Removing value retainer gudgeon pin circlip. - Any other insertion in closed areas i.e. small clips and washers insertion. - Keeps battery charged and handles electrical loads while engine is running. - They are used as detectors (e.g. ﬂame detectors) because they are operated through illumination. I-When only the exhaust port is open (as in the ﬁgure) the exhaust gases are forced out. 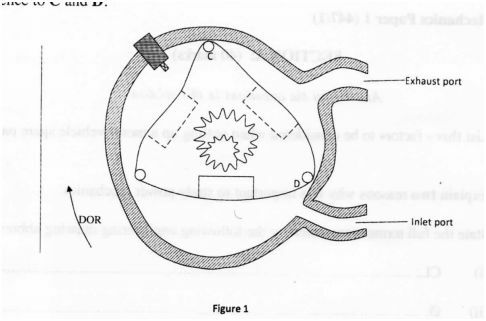 I-Further rotation of the rotor opens the inlet port and closes the exhaust port. I-When ‘C’ closes the inlet port there is maximum intake of airl fuel mixture the mixture is compressed into a very small volume. 7 a) Components of power transmission system. b) - Modem vehicles are designed with collapsible steering columns as a protective measure. The steering column is made of two parts which are ﬁtted together in such a way that they can ‘telescope’ as the steering column collapses during a head-on collision, which throws the driver forward. - Apply the correct soldering rod and heat dipped in ﬂux. - Allow to cool and remove unwanted solder. b) (i) ‘Leading’ shoe - it rotates in opposite direction to the brake disc. It provides of the braking. (ii) ‘Trailing’ shoe - it rotates in same direction to the brake disc. It provides the braking force. 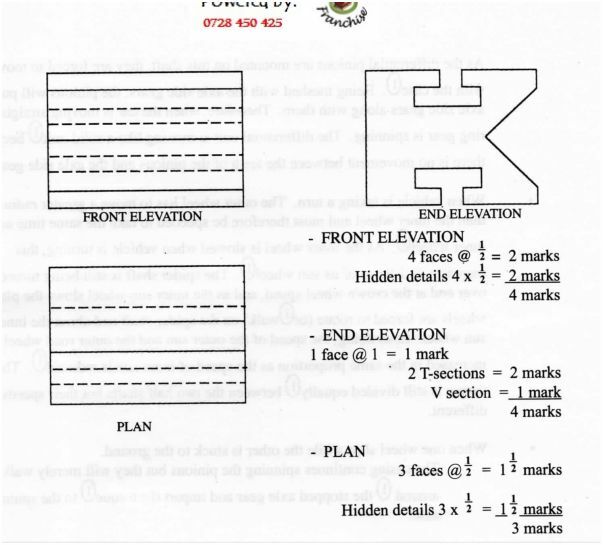 9. a) Purpose of ply-rating of a tyre. It indicates the load range and inﬂation limit v@ of the tyre. - lowers engine position or centre of gravity. - effects on one wheel are not transmitted to the other wheel. - Provides a more comfortable ride. F-Sun wheel or side gears. C) When vehicle is running straight propeller shaft turns the ring gear pinion shaft. The pinion tums the ring gear, which in turn revolves the differential casing When the casing tums, the differential pinion shaft tums with it . As the differential pinions are mounted on this shaft, they are forced to move with the case®. Being meshed with the axle side gears, the pinions will pull the axle side gears along with them. Therefore, when t-he car is moving straight, the ring gear is spinning. The differential unit is moving like a solid unit because there is no movement between the teeth of the pinions and the axle side gears . When vehicle is taking a turn. The outer wheel has to move a greater radius than the inner wheel and must therefore be speeded to take the same time as the inner wheel®. As the inner wheel is slowed when vehicle is tuming, this increases resistance of its sun wheel . The spider shaft is still being turned end over end at the crown wheel speed, and as the inner sun wheel slows the planet wheels are forced to rotate (or walk) on the spider shaft and about the inner sun wheel. In so doing, the speed of the outer sun and the outer road wheel is increased in the same proportion as the speed of inner sun is reduced . 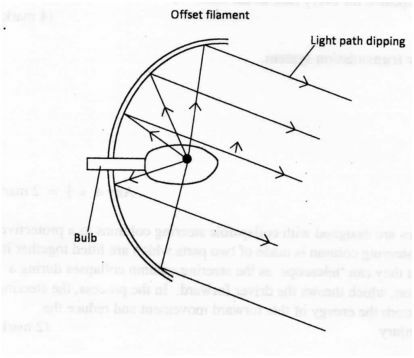 The torque is still divided equally between the two half shafts but their speeds are different. When one wheel slips while the other is stuck to the ground. - The casing continues spinning the pinions but they will merely walk around ® the stopped axle gear and impart the torque to the spirming axle. The crankshaft tums the camshaft. As the camshaft is tumed, the camlobe reaches an upright postion ® and lifts the tappet . The ta t then pushes up the push rod. 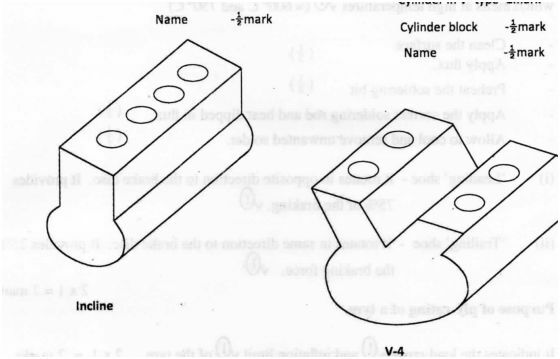 The pushrod movement makes the rocker arm to shivelgin its pivot at the rocker arm shaft thus pushing the valve downwards to open it (D at the same time compressing the valve spring . Exposed to the atmosphere hence better at heat dissipation. Are self cleaning on the surface due to the centrifugal forces.